Below are some of the questions people ask us most frequently. If you have questions that aren't on this list, feel free to contact us, and we'll do our best to answer them for you. Is it safe to ship these birds? We get asked this question so many times... and If we got paid $10.00 for every time that question were asked, we could easily donate all that money to a charitable organization, and it would sustain itself and bless the lives of so many people... for a very long time. These birds can be safely shipped in our USPS Approved shipping containers which are certified and approved by the US Postal Service. We accomplish this by simply working with the closest affiliates in our network that are also nearest your location, so that we can get the birds to you in the quickest and safest manner possible. These birds once released, only fly approximately 50 miles to make it back home. They are trained though to fly as far as 150 miles. 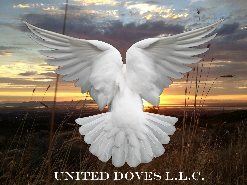 In fact, did you know that the MAJORITY of all white dove release companies all across America that are now in existence, at one time or another, had to have their birds they acquired for their business (SHIPPED SAFELY THROUGH THE US POSTAL SYSTEM TO THEIR OWN LOCATION?). It's true. We have more than enough data to prove this, as we have been supplying birds for this industry for over 25 years by shipping birds to new startups all across the entire USA, so that they can have the opportunity to start their own dove release business in their area! Anyone that tells you that shipping birds is cruel or unsafe, is feeding you a bunch of nonsense and are simply ignorant or in denial for that matter. Shipping birds is 100% safe, has been and always will be, and the post office has accomodated the best safe practices for these birds since 1985. Its been going around for that long. The approved containers these birds are shipped in are the result of over (40 years of research and development) in making this possible. In fact there are now several different shipping container companies that manufacture approved USPS Shipping boxes for birds and animals of many different types. Do you track all your birds once they are released? Yes we do track all the birds once released, to ensure they arrive home safely after each release. Where do the doves go after they are released? They circle overhead to get their bearings, and then they head home to the loft where they are rewarded with all the food they can eat. Are all doves that are released, trained to return to a home location? Yes! All birds that are released as part of our program are trained on an ongoing basis which keeps their navigation skills sharp and alert. Are dove releases suitable for all different age groups, younger as well as older generations? Absolutely! We perform dove releases for all ages ranging from 2-100 years old. The younger generations, as well as the older generations order these services for all occasions. These services are not age, nor generation specific. These birds capture everyones attention and Interest, regardless of age. How do the doves find their way back home? 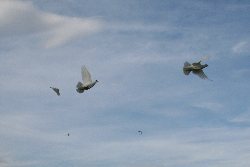 The released doves are released are called Rock Doves, and they also are known as white racing homing pigeons. They navigate their way home using magnetic fields. How long does it take for the doves to get home? The doves travel between 45-50 miles per hour and usually fly non-stop until they reach their home. How many doves should I release? We can release 1-100 doves at a given time. 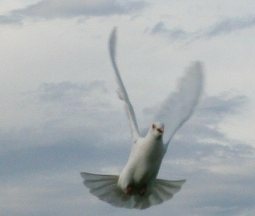 However, the number of doves released is a personal choice. Please see our Dove Release Packages page for details. Will the doves make a mess? The doves are fed a special diet before they are released, enabling them to perform without soiling. They fly with their feet tucked up underneath their body, which also prevents droppings. Can the doves be bought from a pet store and be released? No, doves bought in pet stores do not have the homing ability; therefore, it would be inhumane to release these pet-store doves in the wild. They would quickly fall prey to other animals. Please support your local dove business by arranging the birds through trained professionals. The goal is to have people think and talk highly of the service, not make fun of it. Dove releases not performed by knowledgeable staff can bring undesired results. There is a right way and a wrong way to liberate doves. The handlers have many years experience releasing doves, and will take care of the arrangements so you don't have to worry on your special day. Can the doves be released indoors? No, they are trained only to be released outdoors. However, they always make a beautiful indoor display. Can the doves be released at dark? 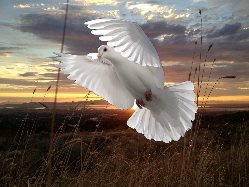 Normally the doves must be released one hour prior to sunset to enable them to return home to their loft before dark, however, if prior arrangements are made, we can safely release them for plays at nightime. Please click here to calculate 'sundown' in your area. There is a large debate among other individuals in this industry that say that it is "unethical" to release the birds at nightime. This is strictly a preference decision on behalf of the handler. As an active member of the most reputable organization in this country that deals with Racing Birds, The (ARPU) American Racing Pigeon Union, we have birds that fly at night time that are trained to do so. True racing homing pigeons should only be released if they are in the condition to do so. Races can range anywhere from 150 miles- to as far as 500 miles. These birds fly nonstop to reach their destination and are truly incredible. A White Dove Release Professional should only release their birds according to the capability their birds possess to safely make it home, this is the bottom line. If the birds are trained properly, they can fly anytime of the day. There are plays all over the country that release doves at nightime, they can do this because they are trained to do this. It all goes back to the knowing of the capability of the birds that are being released by the handler. What happens if inclement weather prevents the release? The doves may be displayed indoors. Please see further details concerning this on our Policy agreement. Can the doves be released from your hands? Yes!! We allow many of our clients to hold the dove prior to releasing it,however, care must be taken when handling the doves in order to prevent unintentional injury to the birds. We show you how to properly handle them so when its time to let them fly, it makes for a spectacular scene! This opportunity to hold the doves adds value to the overall experience for our clients. Please ask the coordinator about this opportunity. 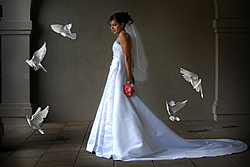 How can doves be released at a church wedding? 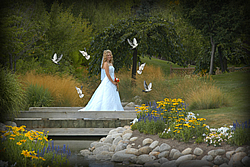 The doves can be released outside, following the ceremony or as the couple leaves the reception. This dove release can take the place of throwing rice or other common rituals.